Every curly haired girl has been here before: It’s the morning of a friend’s wedding, baby shower or other big event. The weather is rainy and humid and you just know your hair isn’t going to cooperate. Ladies, don’t stress! Curls are in and I have plenty of tricks up my sleeve to help you create the perfect style and highlight your beautiful, natural hair! Use a heat protection spray to prevent heat damage, then double check to be sure your hair is 100 percent dry before using any type of iron. 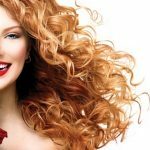 If you are happy with the overall look of your curls, use a curling iron with a barrel slightly larger than your natural curls to tweak and fix up little pieces. Choose curls on the sides and back of your hair to fix up to create a polished yet natural look. Looking for an elegant and polished hairdo, but don’t have time for a blow out? No worries! Opt for a curly style with soft, face framing curls. Use a large barrel curling iron to soften the curls around your face, and a few throughout the hair for a polished and beautiful ‘do for those big events! Interested in learning more or having your hair professionally styled for an event? Contact me online or at 818-926-4050 today to set up an appointment!